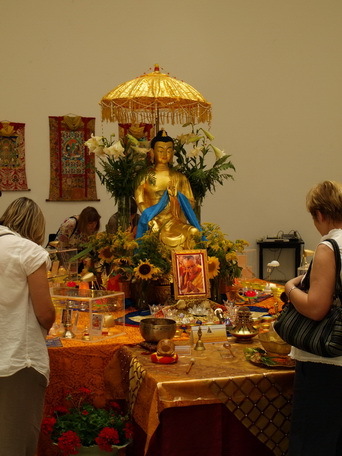 In conformity with its non-sectarian approach respecting all the different Buddhist schools ‘Padmasana’ the Buddhist Society of Croatia invited the Maitreya project exhibition of the sacred Buddhist Relics to Zagreb on 12th, 13th and 14th of August. 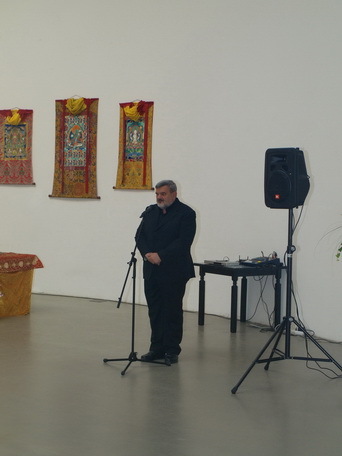 The exhibition was dedicated to World peace, non-violence and tolerance. 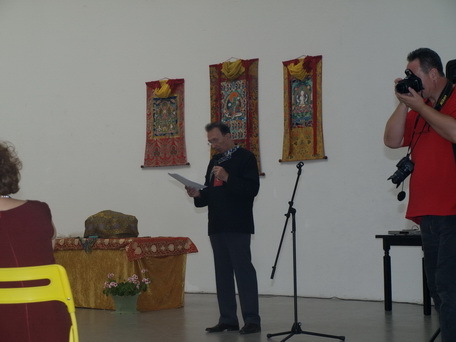 The unique and precious collection of Relics which were displayed in the gallery of the Croatian Association of Artists, trg žrtava fašizma bb, included the relics of the historical Buddha, Buddha’s close disciples as well as known Buddhist masters from different traditions. 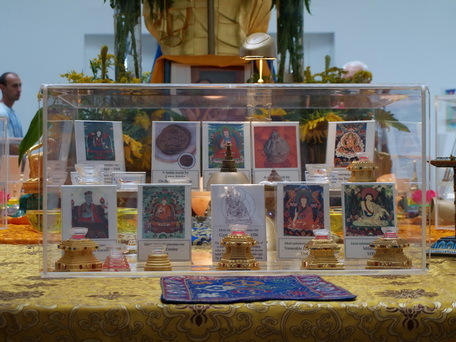 On display were relics from great Buddhist masters of India, Burma, Indonesia, Thailand, Korea, Taiwan, Tibet, France etc as well as offerings of sacred relics of Shakyamuni Buddha from the private collection of H.H the Dalai Lama. 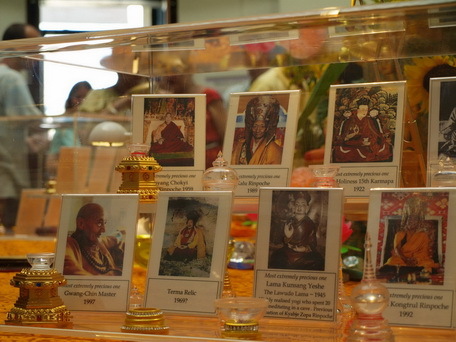 The relics included those of Great Masters such as Nagarjuna, Bodhisatva Chophak, Yeshe Tsogyel, Lama Atisha, Longchenpa, Milarepa, Marpa, Lama Tsongkhapa, Geshe Chekawa, H.H The First Karmapa, Master Seong-cheol Sunim, Gwang-Chin Master, H.H Dudjom Rinpoche, Geshe Lama Konchog and many others. These relics manifested spontaneously and were found among the cremation ashes of these masters and resemble beautiful pearl like crystals. They are a result of the spiritual qualities of love and wisdom left to bless all beings, to remind us of our own essential nature of purity and our inner potential to manifest that. 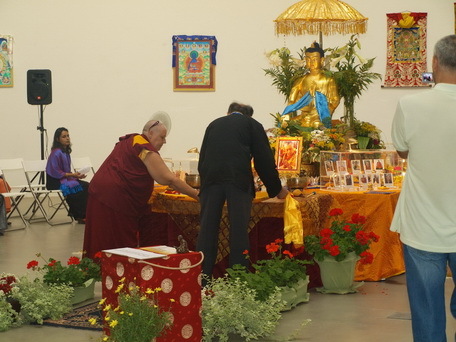 To honour the relics and to promote peace, love and tolerance the Gallery was decorated with thangkas, sacred spiritual arts, a shrine for world peace and many quotations on peace and tolerance of distinguished personalities like Mahatma Gandhi, Mother Teresa and so on. 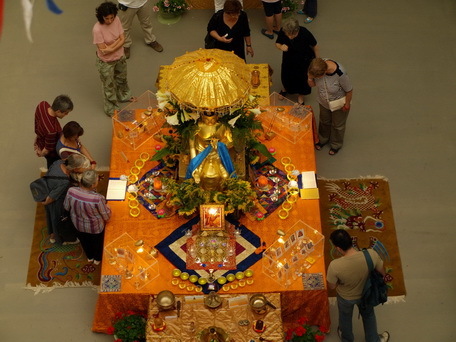 With the display of the relics the circular gallery was transformed into a holy sphere with the relics emitting a peaceful positive energy which was serene yet very powerful. 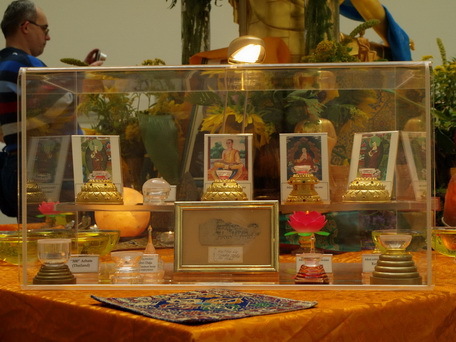 The relics were displayed in protected glass cases in the centre of the hall, amidst a majestic exhibition of lights, candles, kataks, crystals, Flowers, a graceful statue of the Maitreya Buddha, the embodiment of loving-kindness and a statue of a little Buddha. 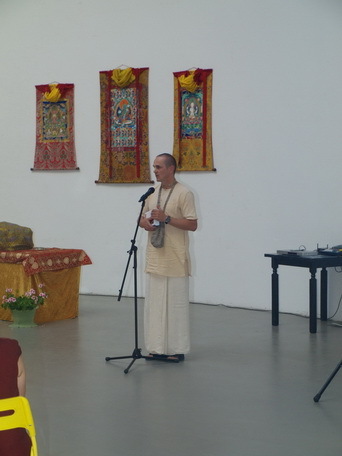 Having completed all the arduous preparations the opening ceremony began on the 12th of August with an audience of about 120 people, invited guests only. 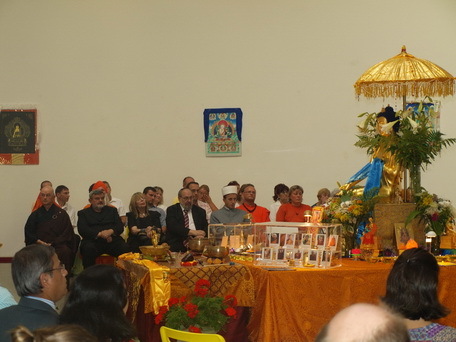 Besides the Relics themselves what made the opening ceremony a memorial unique event was the presence and participation of the representatives of almost all the different Religions present in Zagreb. 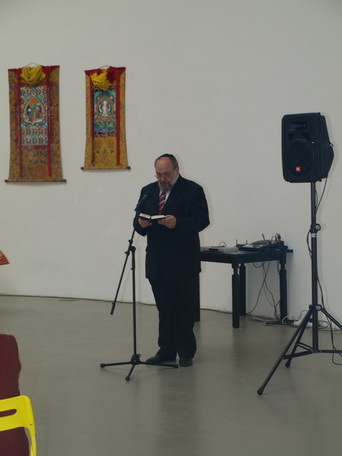 These included the representatives of the Orthodox Church represented by Mr Prota Marinko Juretić, the Jewish community represented by Rabin Lucijano Moše Prelević, the Islamic community represented by Prof. Mevludi ef Arslani, Buddhist community represented by members of Padmasana Buddhist Society and Mr Zarko Andričević of the Dharmaloka Buddhist Center and the Hindu communities (including a group from Sai Society, Mr. Tomislav Klasnić from the Hari Krishna community, Swami Vivek Puri representing Yoga in Daily Life organisation and Ms Avadhutika Ananda Arpana Acharya from Ananda Marga Yoga Society ). 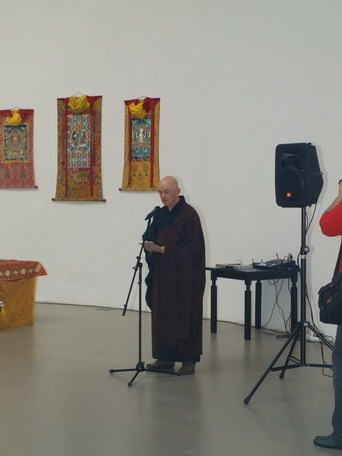 The host for the ceremony, invited all the participants beginning with a speech delivered by the President of the ‘Padmasana’ Croatian Buddhist Society, Mr Dragutin Šmalcelj explaining the purpose and aim of the exhibition and the relics themselves. He ended his speech quoting “All of us are like the drops of the same ocean and the purity of this ocean is dependent on the purity of these drop.”This was followed by the President himself offering the traditional Kadhak on the Relic shrine. 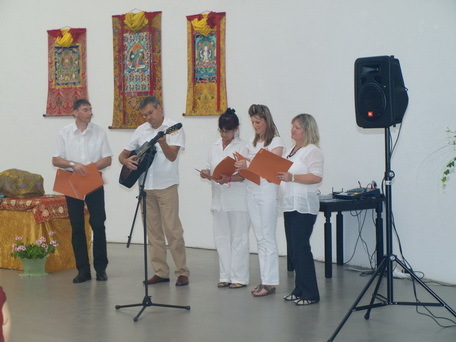 Then the Vice President of the ‘Padmasana’ Buddhist Society Mrs Reena Šmalcelj addressed the audience in English due to the presence of foreign Guests, thanking the International Relic team managers, the members of the Relic organisators for Croatia-‘Padmasana’ Buddhist Society, the participants from various spiritual traditions and all the guests present on this occasion. 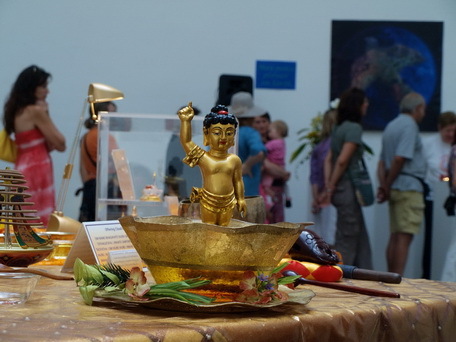 In a symbolic gesture of peace, love and tolerance continuing over generations to come, the youngest member of the Padmasana Society lit the lamp on the world peace alter. 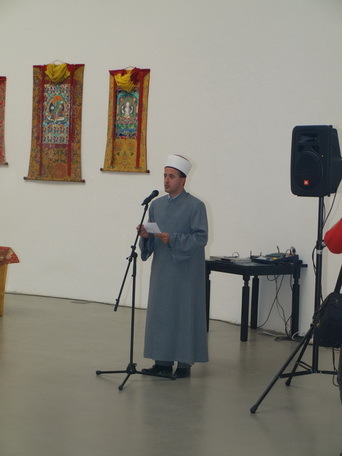 After this to a hearty applause of the audience the representatives of the various Religious groups chanted prayers sacred to their traditions or gave a speech. We were all touched by the sincerity, humbleness and the common appeal for peace, love and tolerance made by all the different Spiritual representatives. Their presence together in one place itself gave a powerful message of peace, love and tolerance which is what the world really needs today. It was also heartening to see the presence of many distinguished people from different Government and non-Governmental organisations and the big interest of the media (TV, radio) and the press. 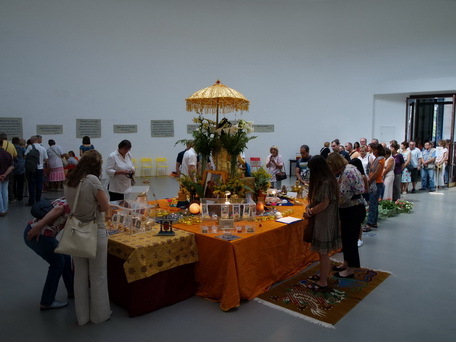 Thanks to the media and press the event was well advertised giving the masses an opportunity to visit the exhibition in the following days. 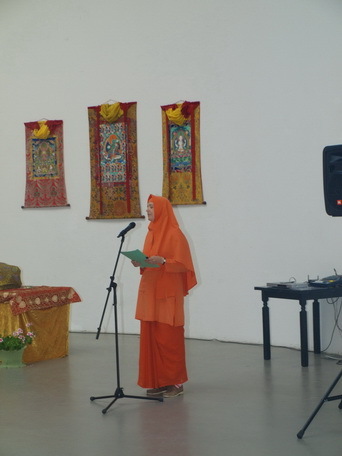 Towards the later half of the opening ceremony, one of the International Relic Tour managers Ani Siliana Bossa delivered a speech about the Relics following which the audience spent some time to see the relics, circumambulating around the Relic shrine, receiving their blessings. 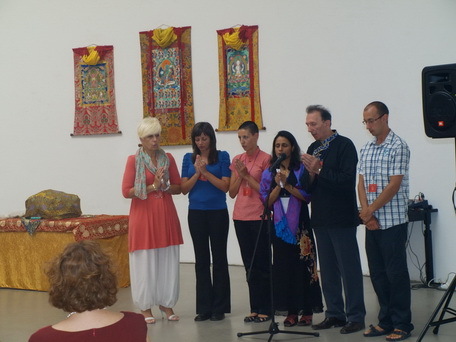 The ceremony closed with a dedication prayer dedicating all the merits for the good of all beings. No one left the opening ceremony disappointed. Everyone was touched deeply in their own way. 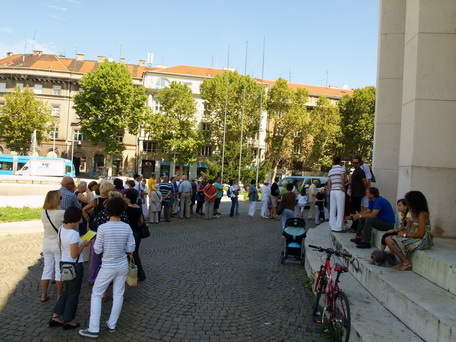 In the following days, 13th and 14th of August the crowd poured in constantly without any interval from 10am to 7 pm. 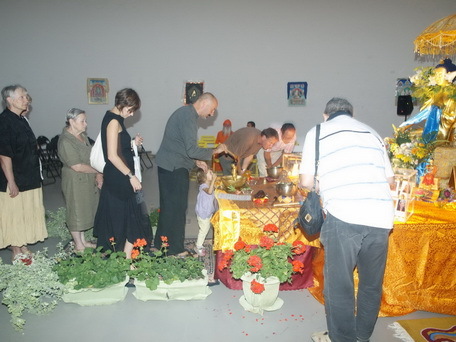 Despite the scorching heat, people stood patiently in a line entering the gallery to make purification and prayers for world peace while bathing the statue of the little Buddha, making offerings of sound by ringing bells or other instruments on display, seeing and receiving the blessings of the relics, circuambulating around the Maitreya Statue and turning the Mani pray wheel, tracing the words of the sacred Sanghatagarbha sutra in golden ink, reading lines from the Golden light sutra, burning lamps at the world peace shrine and receiving the blessing of the relics directly on the head . Of course everyone was free to choose whatever activity they wanted to engage in. 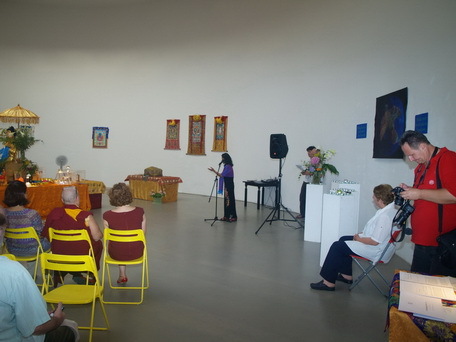 Also chairs were provided in the hall for all those who wanted to meditate or just relax in the peaceful surrounding. Throughout these two days we were overwhelmed to see approximately over 3000 people from all ages, religions, backgrounds and occupational fields as well as people from the outskirts of Zagreb and some tourists. 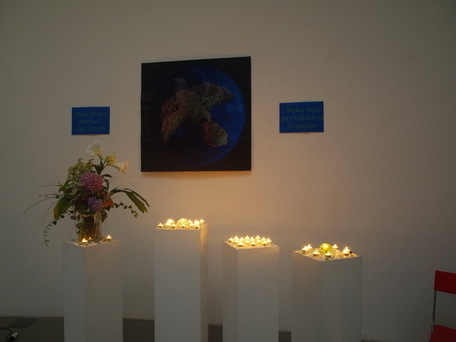 A number of people were deeply touched, emotional with tears streaming down their faces as they entered the Gallery. 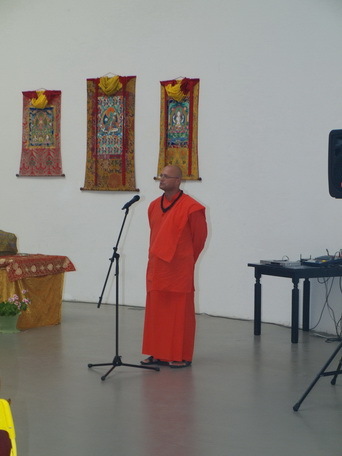 Many people came forward to thank the Padmasana members for organising such an event, some even saying that in all their years this is what they were looking for. Days after the event we are still receiving such kind messages as well as many comments of how so many people are feeling happier, peaceful, fulfilled or just that somehow the event has made a difference to them. 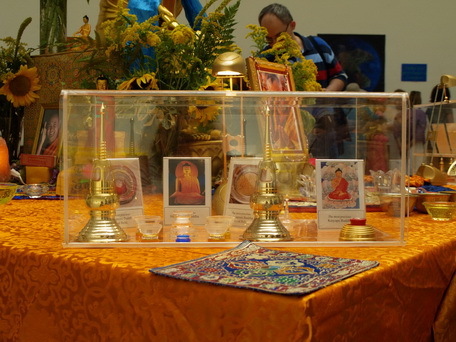 For all of us of the Buddhist faith meeting the Relics was like meeting the Buddha, in terms of the awakened qualities of love, compassion and wisdom in the ultimate sense. 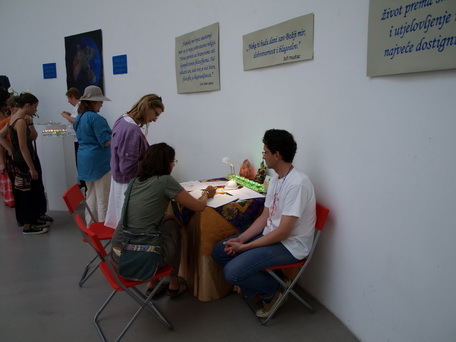 It gave us a chance to realise and feel these inner qualities within ourselves, these qualities that although temporarily obscured are not different from that of the awakened mind. 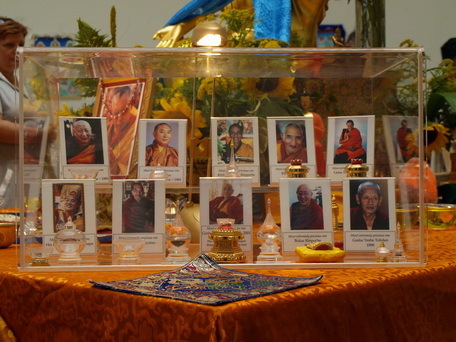 We, the members of the’ Padmasana’ Buddhist Society are honoured to be instrumental in giving a lot of people the opportunity to experience these inner qualities after all benefitting all beings in various ways is the very intention of us following this spiritual path.